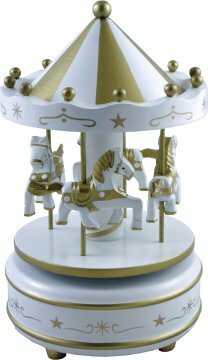 BBCAR299 "Charm" White & Gold Magical Carousel.Music "The magic flute" Mozart. An enchanting musical carousel with four miniature merry go round horses. Hand painted in white with gold highlights as the traditional music box plays the horses go round the carousel. A beautiful keepsake music box. Approx Size : 18 x 10.6cm (7 1/8" x 4 1/8") Order Code : BBCAR299 Price : £22.99 *Please note this is an ornamental item that contains small removeable parts. *It is not a toy and not suitable for children to use unattended.